If you know of Antonio Soler from his Scarlattiesque keyboard works, then you’ll have a good idea of what to expect from this album devoted to his choral music. Like those sonatas, everything here is upbeat and rhythmically propulsive. And that Spanish flavour, that always seems more apparent in Soler than in any of his contemporary’s work, runs through every phrase of this music. 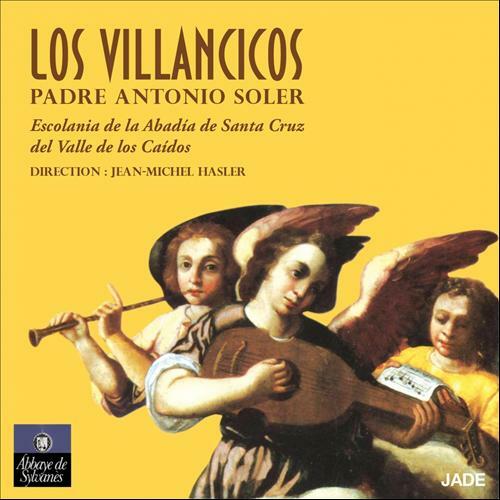 The ‘Vilancico’ is a musical genre almost entirely confined to the Spanish Baroque. It is comparable in scale and drama to Bach’s church cantatas, but, if Soler’s contributions to the form are anything to go by, it has more rustic roots and a more celebratory, rather than reverential, style. Jade, like many French labels, and only French labels in my experience, do not give any English translations in their liner. (There’s no Spanish either, which is perhaps even more surprising.) But, with the assistance of my Francophone wife, I’ve been able to decipher that a Christmas story is played out through these movements. A priest, a poet and a child are planning a nativity play, but each has different views about how it should be done. 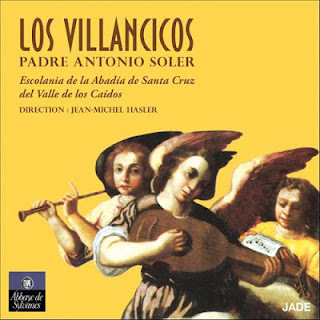 The subject is ideal for Soler’s music, combining as it does a celebratory religious theme and a strong rustic folk element. Soler’s music is continuously upbeat here, but he provides enough variety in his textures and melodic contours to prevent it ever sounding monotonous. In fact, the sheer invention of this music is its strongest asset, followed closely by its distincive melodic identity. The performances are generally good, but are seriously let down by the boy trebles, who are given prominent roles, but whose singing is insecure and seriously out of tune. The rustic identity of the music can accommodate a certain roughness in performance, but not to this extent. This is a real shame, because the rest of the music-making is continuously inspired. The Pygmalion Ensemble specialises in Baroque music on classical and folk instruments. Although I’m sure that Soler’s score does not specify as much, the performance includes contributions from castanets and, even more intriguingly, xaranbel, or perhaps some other Iberian bagpipe. The result is a continuously upbeat and joyous sound, ideal for the Christmas theme. A mixed welcome then, for this intriguing disc. The sheer enthusiasm of the performers for this obscure repertoire ensures a performance in the ideal spirit for the music. A performance that focussed too much on the precision of ensemble and intonation might miss lose the essential rustic colouring. Even so, the inaccuracies in the singing here really are a distraction, and are all the more frustrating given the limited opportunities we get to hear this music.